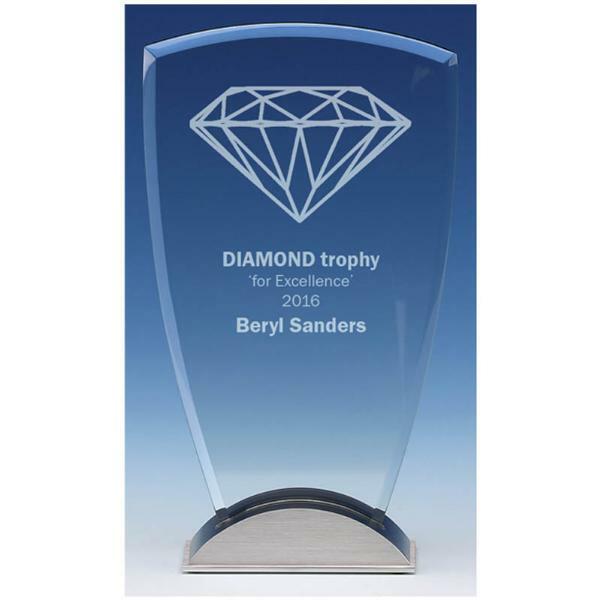 The engraved Ovation Jade Glass Award is a simple but stylish glass award on a silver coloured base. The ovation jade glass award is supplied in a gift box, and the price includes up to 50 characters engraved for free. Any additional characters to personalise the ovation jade glass award are then charged at 25p each, and there is also an additional cost for a logo. The Ovation Jade glass award is available in a 17.75cm or 23cm tall size. The engraved Ovation Jade Glass Award is postage band B. Unfortunately this award has been discontinued by our supplier and is now no longer available.